In addition to Salt Lake Community College students that already live in the Salt Lake valley, every year a large number of students attend the school from out of state or another country. These students travel to Salt Lake to go to college because of what SLCC has to offer. Many students attend SLCC because it offers courses that can be transferred to a four-year institution, more affordable lower level courses, and a large variety of associate degree programs. Another reason new college students start at SLCC is because they have had friends or family recommend the school. “My mom works here full time so I have always known about SLCC,” said Erin Scott, a general education student. The college provides advantages for students who attend a four year school. Terrell Anderson is a mechanical engineering student who attends the University of Utah during the regular school year, but attends SLCC during the summer semester. “We all know about SLCC at the U of U because the teachers are better. The teachers are a lot more accommodating. 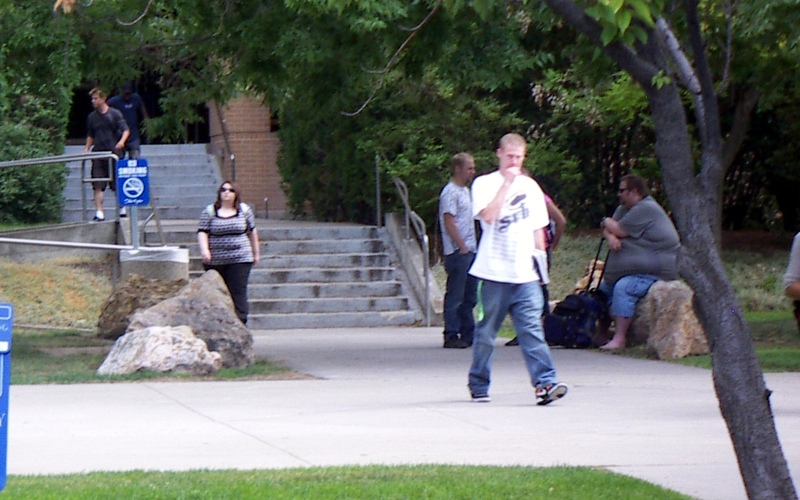 The counselors at the U recommend SLCC for the summer semester,” he said. Salt Lake Community College takes different steps to inform prospective students of its existence, which allow students to learn about SLCC in more ways than one. Utilizing both the press and the Internet help the school in its endeavor to be known throughout the United States and the world. When the school is doing something that deserves media coverage it sends out a press release. The coverage of the event by the press helps to put out information about the college. For example, on July 19 the SLCC Veterans Center hosted an event called Helmets to Hardhats. “This program gives veterans building management degrees,” Tlou said. In attendance at the event were Mayor Russ Wall of Taylorsville, State Senator Karen Mayne of West Valley City, and Darrell Roberts, the National Director of Helmets to Hardhats. SLCC is part of this program because of the commitment it has made to veterans. The press coverage for this event will help get the word out about SLCC. This is referred to as earned media, which simply means media coverage that is not paid for. SLCC does advertise itself through what is referred to as paid media, which is purchased media time such as TV commercials. One of the most common ways for a prospective student to find out about SLCC is by using a search engine. Whether a student searches for nursing schools or for a school where they can go snowboarding while attending school, Salt Lake Community College usually appears in the results. SLCC is also known for its other entities like the Community Writing Center (CWC), located in downtown Salt Lake City at Library Square. At the CWC, anyone can walk in and receive help with writing. Students can come in and get help with papers, and the general public can come in free of charge and receive help with any form of writing they have. Salt Lake Community College is taking great lengths to distinguish itself from other institutions of higher learning. The motive for its increasing outreach is not simply just to find more students, but rather to fulfill the school’s mission.